We’ve had a number of good trades in 2016. In fact, only 1 of 7 trades was closed in the red. It’s tempting to label our S&P 500 trade (bought at 1,828, sold at 2,040) the best trade of 2016 (thus far). True, the S&P 500 trade was the most contrarian trade of them all. It required a fair amount of moxie to go against the crowd. The monthly bar chart shows a birds eye view of the setup. 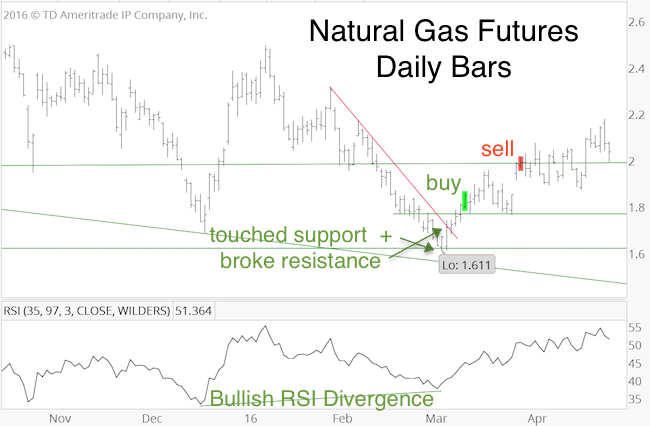 The daily chart shows a bullish RSI divergence and the touch of double support. Natural gas seasonality turned bullish in early March. Some measures of investor sentiment were at or near bearish (bullish for gas) extremes. Technicals, sentiment, and seasonality all pointed in the same direction (up). The pieces for a high probability buy signal were in place. We bought on March 10, after trade poked above the initial red resistance line. We sold on March 30, when trade was overbought and against resistance. 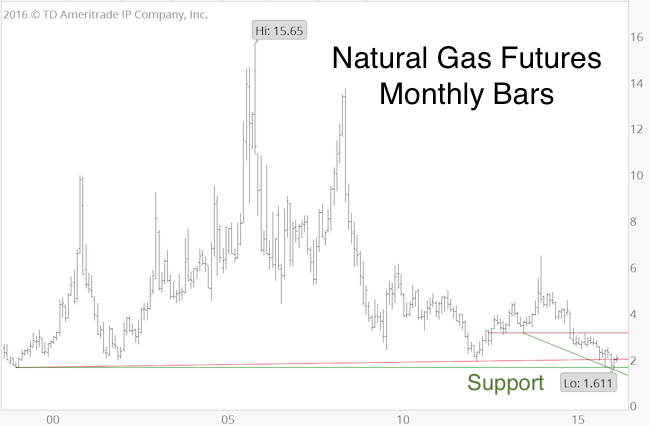 The profit was about 14% for natural gas futures and about 9% for the related ETF (UNG) trade (corresponding commodity ETF returns tend to be lower due to contango). 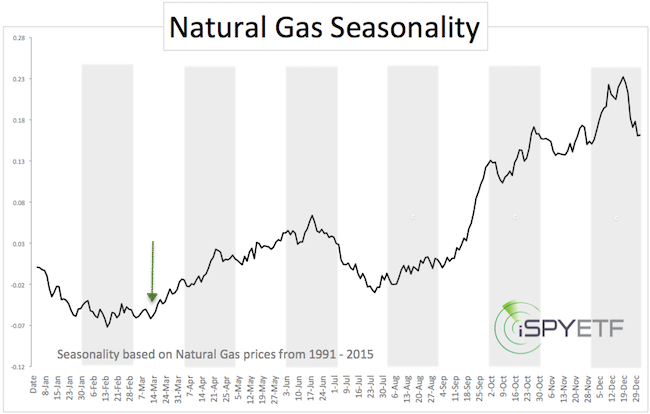 Based on seasonality, there is more up side for natural gas, but the probability of further gains is not as high as it was in early March. The Profit Radar Report is always on the prowl for rare high probability trades. The full year S&P 500 forecast is my biggest project of the year, and quite frankly it’s kind of a thankless job. Why? It gives every critic a documented, black and white foundation for criticism. It is impossible to predict a full year of stock market future, that’s why market forecasts are loaded with ‘ifs,’ “buts,’ and other ambiguities. Anyone attempting to predict the unpredictable is doomed to miss the mark. That’s why no other newsletter (at least not that I’m aware of) publishes an actual full year S&P 500 chart projection. Accountability is an underrated (if not entirely ignored) concept on Wall Street. 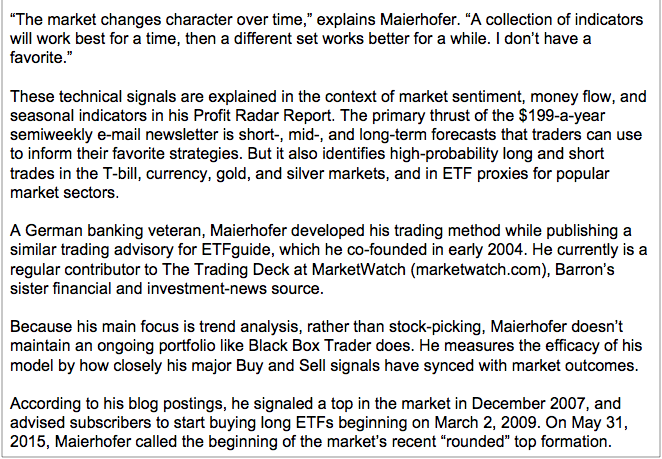 But, what’s the purpose of following many time-tested indicators if we don’t put them to work? The 2016 S&P 500 Forecast was published on January 31, 2016 and is available to subscribers of the Profit Radar Report. Below is an excerpt of the 2016 S&P 500 Forecast (with some minor edits in consideration of paying subscribers). At the time of publication, the S&P 500 traded in the mid 1,800s. One of the key questions addressed by the forecast was whether the May 2015 all-time high at S&P 2,134 marked the end of the bull market. There is Fibonacci support at 1,855 (Fibonacci projection level going back to 2002). There is an open chart gap at 2,043.62 (just above Fibonacci resistance at 2,041). This is the bare minimum target for a Q1/Q2 rally. Bull markets die of starvation. Just as a fire needs wood to burn, the stock market needs fresh buyers to move higher. Fully invested investors can only do one of two things: hold or sell. Neither action buoys price any higher. Excessive optimism is an indication that buyers have become rare (because everyone who wants to buy has already bought). That’s why excessive optimism usually precedes a new bear market or sizeable correction. However, investor sentiment near the May 2015 all-time highs was not as euphoric as at prior tops. Historically, sentiment around May 2015 was not bullish enough for a major market top. What about current sentiment? Sentiment dropped towards extreme pessimism in January (some indicators triggered panic readings), which should provide a bullish tailwind for the weeks/months ahead. This target was already captured. What’s next? A short-term outlook is available here. Is Big Tech Underperformance Bearish for Stocks? Large cap technology stocks – the notorious US stock market ‘alpha male’ – is trailing behind. The chart below plots the Nasdaq-100 (represented by the QQQ ETF – right graph) against the S&P 500 and NYSE Composite. 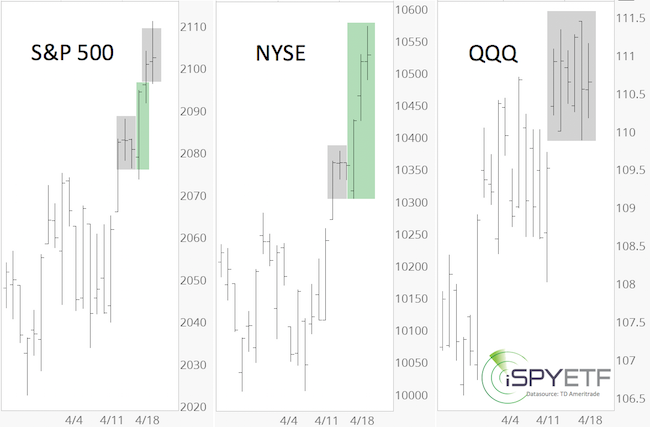 QQQ has been stuck in neutral, while the S&P 500 and NYSE move ahead in second and third gear. What does this mean for the stock market in general? We’ve probably been conditioned to believe that large tech underperformance is bad for the broad market. And over the short-term (1-4 weeks), historical performance numbers support this conclusion. Over the long-term (3-12 months) however, large tech underperformance is actually positive for the overall market. How come? The NYSE Composite Index consists of some 1,900 stocks (large, mid, small-cap stocks). The Nasdaq-100 of only 100 large cap tech stocks. The fact that the NYSE Composite started to outperform the QQQs shows that liquidity is penetrating all corners of the market. That’s a good long-term sign. However, there is a bearish fly in the bullish ointment. The second chart plots the S&P 500 against the percentage of S&P 500 and NYSE stocks above their 50-day SMA. The percentage of NYSE stocks above their 50-day SMA has been stronger than the percentage of S&P 500 stocks, which confirms the strength of the broader, more diversified NYSE composite. As of Wednesday’s close, the percentage of NYSE stocks failed to confirm the new S&P 500 (and NYSE Composite) recovery highs (short red line). 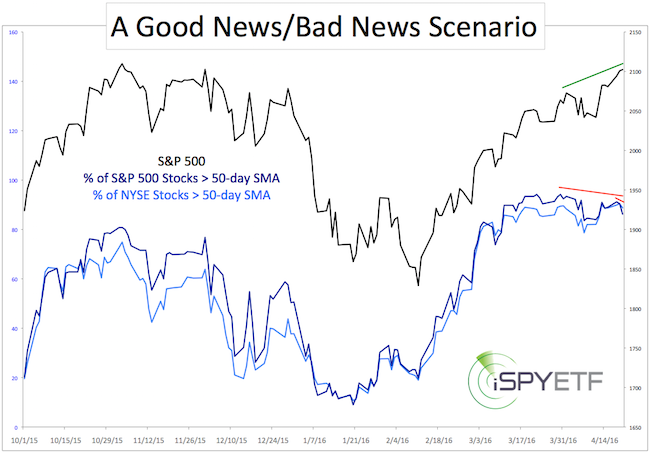 The percentage of S&P 500 stocks above their 50-day SMA has been lagging since March 30 (longer red line). All the strong breadth reading throughout this rally confirmed our February 11 buy signal. Although we anticipated a temporary pullback, the April 3 Profit Radar Report stated that a break below 2,040 is needed as the first step towards confirming further weakness. Staying above support, combined with the long-term bullish developments registered in recent weeks/months has buoyed the S&P 500 higher (the rally from the February low looks like a micro copy of the 2013 rally). Unless the bearish divergences mentioned above are erased, the S&P 500 is nearing another inflection zone that may rebuff stocks for a little while. Sometimes, investing can be so simple … if we don’t complicate things. Here is the most basic of ‘indicators’. It has a 100% accuracy rate since the start of the 2009 bull market. In fact, it’s so basic, calling it an indicator is probably overkill. Open chart gaps. The gaps we’re talking about are price gaps caused by overnight losses. Over three years later, the accuracy rate is still 100%. Various market indexes – including the S&P 500, Nasdaq-100 and Nasdaq Composite – left a massive open chart gap on January 4, the first trading day of the year (see chart). This open chart gap (at S&P 2,043.62) was one of six reasons why the Profit Radar Report issued a buy signal on February 11 at S&P 1,828. This chart gap also served as our up side target. The S&P closed the open chart gap on March 17. According to an April 5 Bloomberg article, investors were short $1 trillion worth of stocks (the highest short interest since 2008). Looks like bears got trapped again. 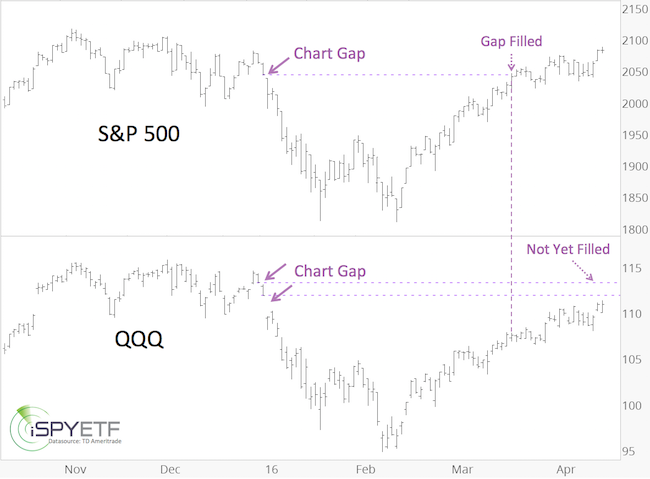 One reason the Profit Radar Report didn’t recommend shorting stocks is the open PowerShares QQQ ETF (Nasdaq: QQQ) chart gap; in fact, there are two chart gaps. One at 111.84, another at 113.25. The gap at 111.84 is massive. History has taught us that shorting against chart gaps tends to be a losing proposition. QQQ has now come within striking distance of the lower gap. There are some bearish breadth divergences already, but once the gaps are closed, the magnetic force pulling stocks higher diminishes, and the odds for a pullback increase. A temporary pullback after (even before) closing the first gap followed by another bull leg to close the second gap is possible. Continuous S&P 500 analysis/forecasts are available via the Profit Radar Report, which was just profiled by Barron’s. 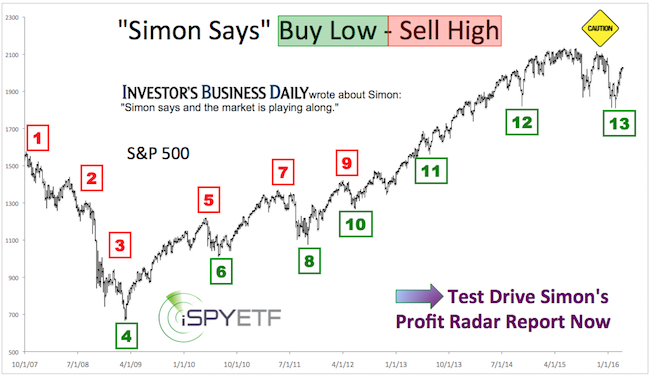 On February 11, the Profit Radar Report recommended to buy the S&P 500 at 1,828 (or SPY at 183). The projected up side target at the time was 2,040. The blue box highlights the S&P’s performance since reaching our up side target. Following the strong up trend from the February low, the market went trendless 16 trading days ago. Quite frankly, we anticipated a deeper pullback after the 2,040 target was reached. The April 3 Profit Radar Report mentioned a couple of bearish divergences at the 2,075 recovery high, but stated that a break below 2,040 is needed as confirmation for a deeper pullback. 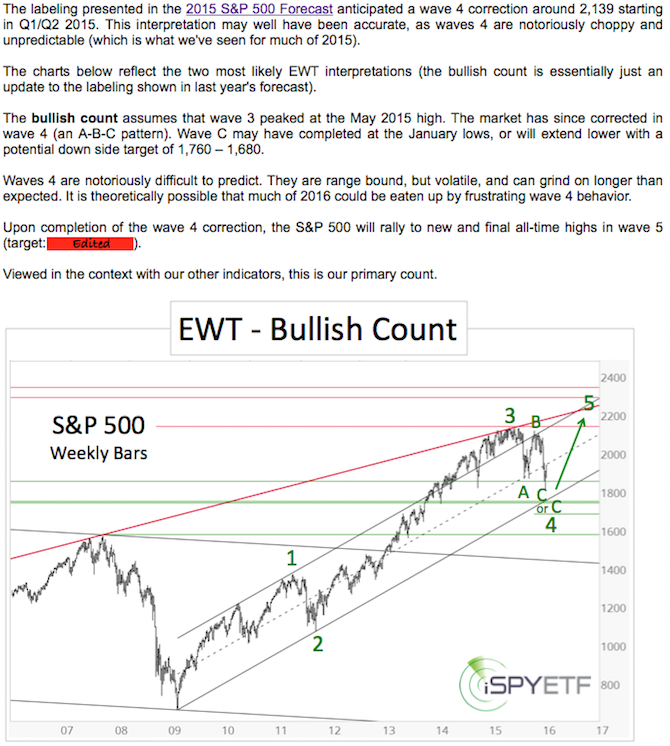 Bullish/bearish scenario: The recent sideways action could be a wave 4 according to Elliott Wave Theory (EWT). Waves 4 are sideways affairs. In terms of classic technical analysis, EWT waves 4 often act similar to triangles. Waves 4 are followed by wave 5 up. A complete 5-wave rally is followed by a larger correction. Bearish/bullish scenario: The April 1 high created a bearish divergence between price and the percentage of S&P 500 stocks above their 50-day SMA and the hourly RSI. This may continue to drag stocks lower. However, once prices are low enough, we’d be interested to buy. Our indicators stopped providing a cohesive directional signal when the S&P first hit 2,040. In hindsight, this explains the trading range since. Unfortunately, there is still no cohesive directional signal. More often than not, this means it’s best to sit on the sidelines. We will consider buying at lower prices or (short) selling at higher prices. The next best setup will be discussed via the Profit Radar Report. 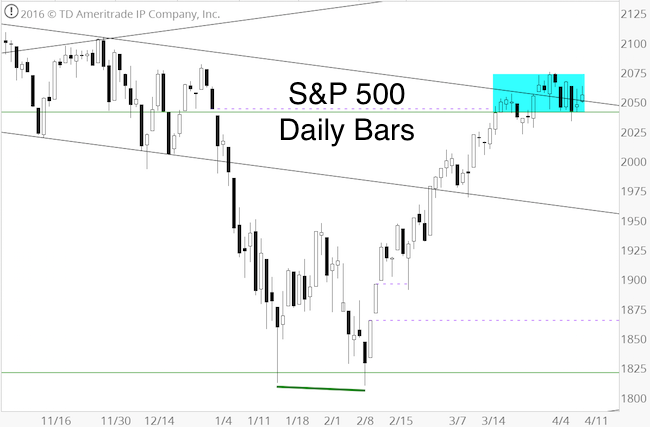 Leave a comment Posted in S&P 500, Technical Analysis Tagged Following a spirited rally from the February low, the S&P 500 has gone trendless. The S&P has been stuck in resistance mud with no net progress since March 17. Is this ‘stuck in the mud’ situation bullish or bearish? 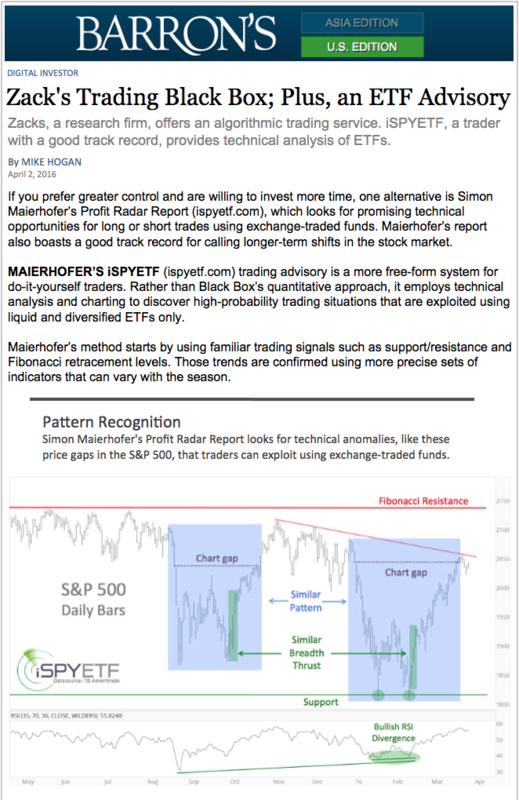 On April 2, 2016, Barron’s featured the Profit Radar Report in their ‘Digital Investor’ section written by Mike Hogan. This one-page column profiled Zack’s $2,995-a-year ‘Zacks Ultimate’ service and Simon Maierhofer’s Profit Radar Report ($199/year). 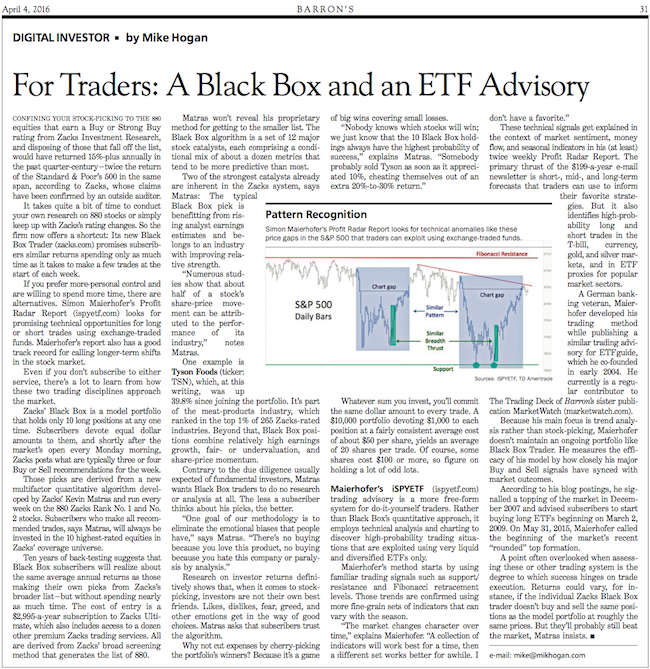 The online version of this column is available here (subscription to Barron’s may be required). The complete magazine version of this article is shown at the end of this article. 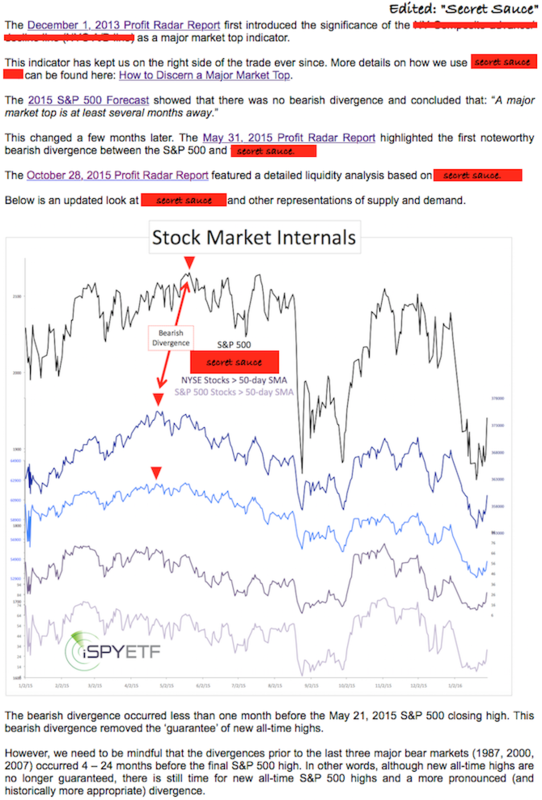 Below is a (edited) version of the article that focuses on the Profit Radar Report.